Cooking and eating with family and friends is part of holiday traditions. Whether you’re hosting Thanksgiving dinner or a cookie exchange, it’s important to brush up on food safety practices. Check out these simple, yet helpful tips to keep you and your family’s food safe during the holiday season. 1. Avoid eating raw cookie dough. Although it might be tempting to sneak a ball of cookie dough before putting your pan in the oven, it’s not safe for consumption. Raw eggs and flour may contain bacteria, such as Salmonella and E. coli, that can make you sick; however, once you properly cook the food the bacteria are destroyed. Always wash hands, cooking utensils and kitchen surfaces with soap and water before and after cooking with raw eggs. Don’t forget to refrigerate any leftover foods and chill them to below 41°F. 3. Double check internal food temperatures. Use a food thermometer to check the temperature of cooked foods using safe minimum cooking temperatures. The color of the meat is not a reliable indicator that food is done. 4. Keep hot food hot and cold food cold. 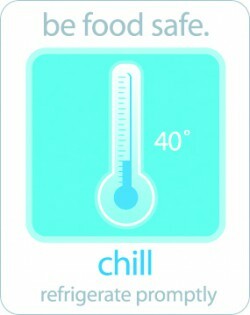 Bacteria grows rapidly at room temperature, so refrigerate or freeze any cold foods and keep any hot foods warm in an oven or in an insulated container. 5. Avoid washing your meat before cooking. Rinsing your meats can potentially spray bacteria onto kitchen surfaces that are near your sink. 6. Safely prepare and roast a turkey. Don’t stress about preparing the turkey this year. Check out our demonstration video with step-by-step directions. 7. Clean. Separate. Cook. Chill. These are the simple tips that cover storing, preparing and serving your food safely. 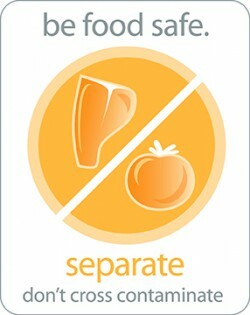 SEPARATE: Separate raw meats from other foods. 8. Don’t use the same cutting board for every food. Separate raw foods from ready-to-eat foods. Use separate cutting boards for raw meats and ready-to-eat items like bread and vegetables. We want your family to stay safe and healthy this holiday season. For more information about food safety and food safety resources, visit our Publix website. Do you have any additional tips to share with us? Share them in the comments below.